The remainder of this chapter discusses instance tuning using the Oracle Database dynamic performance views. However, Oracle recommends using Automatic Workload Repository (AWR) and Automatic Database Diagnostic Monitor (ADDM) for statistics gathering, monitoring, and tuning due to the extended feature list. If your site does not have AWR and ADDM features, then you can use Statspack to gather Oracle database instance statistics. At the end of this phase, you should have a good understanding of the symptoms. If the symptoms can be identified as local to a program or set of programs, then the problem is handled in a different manner from instance-wide performance issues. At any given moment, you know how much time Oracle Database has used on the system. So, if eight minutes are available and Oracle Database uses four minutes of that time, then you know that 50% of all CPU time is used by Oracle. If your process is not consuming that time, then some other process is. Identify the processes that are using CPU time, figure out why, and then attempt to tune them. If the CPU usage is evenly distributed over many Oracle server processes, examine the V$SYS_TIME_MODEL view to help get a precise understanding of where most time is spent. Examine Oracle Database statistics and cross-reference them with operating system statistics to ensure a consistent diagnosis of the problem. Operating system statistics can indicate a good place to begin tuning. However, if the goal is to tune the Oracle database instance, then look at the Oracle Database statistics to identify the resource bottleneck from a database perspective before implementing corrective action. Oracle Database Reference for more information on the STATISTICS_LEVEL initialization parameter. Oracle Database Reference for information about the V$STATISTICS_LEVEL view. This view lists the status of the statistics or advisories controlled by the STATISTICS_LEVEL initialization parameter. To minimize user response time, reduce the time spent by server processes waiting for event completion. Not all wait events have the same wait time. Therefore, it is more important to examine events with the most total time waited rather than wait events with a high number of occurrences. Usually, it is best to set the dynamic parameter TIMED_STATISTICS to true at least while monitoring performance. "Using Wait Events with Timed Statistics"
The V$ACTIVE_SESSION_HISTORY view displays active database session activity, sampled once every second. Investigate wait events and related timing data when performing reactive performance tuning. The events with the most time listed against them are often strong indications of the performance bottleneck. For example, by looking at V$SYSTEM_EVENT, you might notice lots of buffer busy waits. It might be that many processes are inserting into the same block and must wait for each other before they can insert. The solution could be to use automatic segment space management or partitioning for the object in question. Statistics are available in many V$ views. The following are some of the V$ views that contain system statistics. This view displays active database session activity, sampled once every second. V$SEGSTAT_NAME: This view lists the segment statistics being collected and the properties of each statistic (for instance, if it is a sampled statistic). V$SEGSTAT: This is a highly efficient, real-time monitoring view that shows the statistic value, statistic name, and other basic information. V$SEGMENT_STATISTICS: This is a user-friendly view of statistic values. In addition to all the columns of V$SEGSTAT, it has information about such things as the segment owner and table space name. It makes the statistics easy to understand, but it is more costly. Identify the wait events that have the most significant percentage of wait time. To determine the percentage of wait time, add the total wait time for all wait events, excluding idle events, such as Null event , SQL*Net message from client, SQL*Net message to client, and SQL*Net more data to client. Calculate the relative percentage of the five most prominent events by dividing each event's wait time by the total time waited for all events. My Oracle Support notices on buffer busy waits (34405.1) and free buffer waits (62172.1). You can also access these notices and related notices by searching for "busy buffer waits" and "free buffer waits" on My Oracle Support website. This section concentrates on examples using V$SESSION_WAIT. However, Oracle recommends capturing performance data over an interval and keeping this data for performance and capacity analysis. This form of rollup data is queried from the V$SYSTEM_EVENT view by AWR. Starting with Oracle Database 11g, Oracle Database accumulates wait counts and time outs for wait events (such as in the V$SYSTEM_EVENT view) differently than in past releases. Continuous waits for certain types of resources (such as enqueues) are internally divided into a set of shorter wait calls. In releases prior to Oracle Database 11g, each individual internal wait call was counted as a separate wait. Starting with Oracle Database 11g, a single resource wait is recorded as a single wait, irrespective of the number of internal time outs experienced by the session during the wait. "db file scattered read" for information about managing excessive I/O, inadequate I/O distribution, and finding the SQL causing the I/O and the segment the I/O is performed on. Parallel execution servers are used for scanning data. The file_id shows if the reads are for an object in TEMP tablespace (sorts to disk) or full table scans by parallel execution servers. This wait is the largest wait for large data warehouse sites. However, if the workload is not a Decision Support Systems (DSS) workload, then examine why this situation is happening. Examine the SQL statement currently being run by the session experiencing waits to see what is causing the sorts. Query V$TEMPSEG_USAGE to find the SQL statement that is generating the sort. Also query the statistics from V$SESSTAT for the session to determine the size of the sort. See if it is possible to reduce the sorting by tuning the SQL statement. If WORKAREA_SIZE_POLICY is MANUAL, then consider increasing the SORT_AREA_SIZE for the system (if the sorts are not too big) or for individual processes. If WORKAREA_SIZE_POLICY is AUTO, then investigate whether to increase PGA_AGGREGATE_TARGET. If tables are defined with a high degree of parallelism, then this setting could skew the optimizer to use full table scans with parallel execution servers. Check the object being read into using the direct path reads. If the full table scans are a valid part of the workload, then ensure that the I/O subsystem is adequate for the degree of parallelism. Consider using disk striping if you are not already using it or Oracle Automatic Storage Management (Oracle ASM). "Managing Excessive I/O" in the section "db file scattered read"
If it is not possible to switch to locally managed tablespaces, then ST enqueue resource usage can be decreased by changing the next extent sizes of the growing objects to be large enough to avoid constant space allocation. To determine which segments are growing constantly, monitor the EXTENTS column of the DBA_SEGMENTS view for all SEGMENT_NAMEs. Waits for TX in mode 4 can also occur if the session is waiting due to shared bitmap index fragment. Bitmap indexes index key values and a range of rowids. Each entry in a bitmap index can cover many rows in the actual table. If two sessions want to update rows covered by the same bitmap index fragment, then the second session waits for the first transaction to either COMMIT or ROLLBACK by waiting for the TX lock in mode 4. This type of TX enqueue wait corresponds to the wait event enq: TX - row lock contention. Spread the I/O activity across large number of spindles (disks) and controllers. 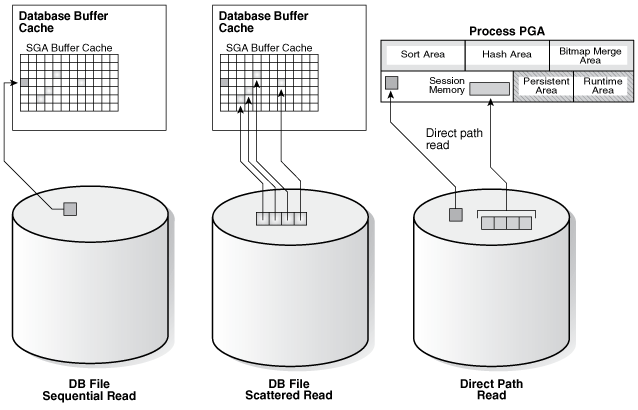 It is possible DBWR is very active because the cache is too small. Investigate whether this is a probable cause by looking to see if the buffer cache hit ratio is low. Also use the V$DB_CACHE_ADVICE view to determine whether a larger cache size would be advantageous. Check if DBWR is slow, possibly due to an overloaded or slow I/O system. Check the DBWR write times, check the I/O system, and distribute I/O if necessary. Check if there are too few, or too small redo logs. If you have a few redo logs or small redo logs (for example, 2 x 100k logs), and your system produces enough redo to cycle through all of the logs before DBWR has been able to complete the checkpoint, then increase the size or number of redo logs.